Please put this photo on your Wirksworth Site. It shows Edwin & Ann Lomas nee Dicken nee Marsden (my Great grandmother) Ann Marsden was the youngest child of Daniel Marsden the tinsmith of The Market Square Wirksworth. She was born to Daniel Marsden & Ellen Wesley see photo X251, and christened on 13 May 1855. 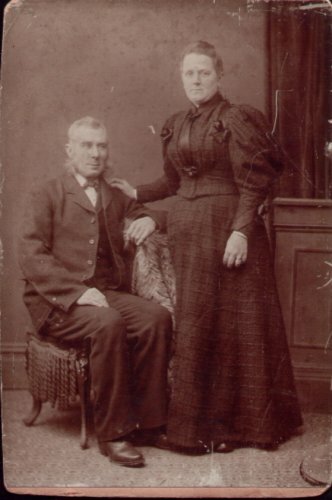 Ann married Robert Dicken a farmer on 17 March 1875 in the parish church in Wirksworth. At Nether Chanderhill farm old Brampton they raised their family of eleven until Roberts untimely death age 41 in Dec. 1891. By 1898 four of their children had died. Ann married again on 21 Jan 1896 in Derby register office. To Edwin Lomas an engine fitter. They had two daughters, but by June 1900 Ann was again a widow. Two sons George & Henry emigrated to America in 1912 employed in the lace trade. Ann died 12 June 1920 and is buried next to her husband Robert in the grave yard of St Peter St Paul at old Brampton. Regards & many thanks for your remarkable web site.